The HTC U11 Plus doesn't offer that much more than some phones released almost a year earlier. However, solid battery life, a slim screen surround and a great - if slightly slow - camera see it through. 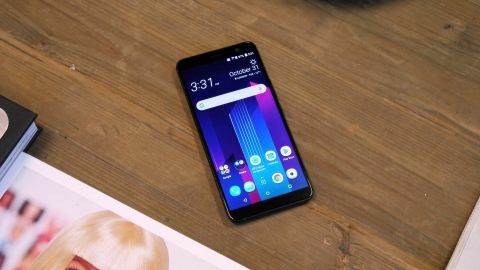 The HTC U11 Plus is a new version of the HTC U11 with this season's must-have: an extended screen that barely leaves any surround cluttering up the front. And that is, for the most part, it. However, a few millimetres added to the height of the HTC U11 Plus have enabled cramming-in a bigger battery to compensate for the larger screen. Plus a little extra for good measure. If HTC's 2017 line-up never appealed, the HTC U11 Plus may not have anything new to awake your interest. And it arrives just before the Samsung Galaxy S9, which may well make some of its tech seem passé. Those offered the HTC U11 Plus on a contract upgrade have nothing to fear, though. This is a top-quality phone with a high-quality camera, good display and smart design. The HTC U11 Plus arrived at the start of 2018, and is priced to roughly match the Samsung Galaxy S8 Plus. SIM-free you'll pay £699 in the UK, that's around $970/AU$1,215, but there's no plan to bring the phone to the US. This is a top-end phone, the kind that deserves some research and thought before clicking the "checkout" button. However, it isn't quite as expensive as the iPhone X or Samsung Galaxy Note 8. The HTC U11 Plus is a well-spec'd phone, but not one that can claim to have it all. Next to its Samsung and LG rivals, a dual-lens rear camera is the obvious missing part. It can't take the blurry-background photos that friends might call "arty" on Instagram and Facebook. We're likely to see phones with Qualcomm's new Snapdragon 845 chipset just a few months after the HTC U11 Plus too, set to offer yet more power and improved efficiency. The rest is largely in-place, though. The HTC U11 Plus has a very high-quality rear camera, if one that is a little slow to shoot, an extra-wide QHD screen and 128GB of storage. HTC specials include punchy BoomSound speakers and Edge Sense, which lets you launch an app by squeezing the HTC U11 Plus's sides. The HTC U11 Plus has the most popular, most common design style among current ultra-high-end phones. There's curved glass on the back, and a band of metal around its sides to join the front and rear glass panels. Its look is less dynamic than the Samsung Galaxy S8 Plus, though, which has a curved front and even more aggressive cutting of the screen surround. Where it leaves virtually zero dead space to the left and right of the display, the HTC U11 Plus actually has slightly more than the cheaper Honor View 10. As such, despite the newer display design, this phone is a little bigger and heavier than the HTC U11. Still, it's only as unwieldy as some of the last generation's 5.5-inch phones, even with a 6-inch screen. The curved rear glass also feels great. HTC has prioritised smooth contours over absolute thinness, as the HTC U11 Plus is relatively thick for such a pricey phone at 8.5mm. But it makes a pleasant change from all the abrupt flat-back phones. HTC calls it a "liquid surface". This rear glass is highly reflective and comes in dark blue and the dark silvery grey we have here, although there's also word of a translucent model. The standard variants are mirror-like, rather than having a multi-layered finish that plays with light. Like other recent high-end HTCs, the U11 Plus has the Edge Sense feature, letting you squeeze the phone to act as a shortcut gesture. As standard it launches the camera, probably the most useful option for many, but you can set it to fire up any app you like. There's 128GB of storage, matching the Samsung Galaxy S8 Plus and LG V30. Unless you’re a media or games hoarder you won’t have to offload photos from the HTC U11 Plus for a long, long time. The most contentious part of the HTC U11 Plus's hardware is its lack of a headphone jack. You do get a pair of USB earphones in the box, and a 3.5mm jack adaptor, but if you have a beloved pair of wired headphones, you might want to consider the OnePlus 5T or Honor View 10, which are several hundred dollars/pounds cheaper and have a 3.5mm socket. While there are no particularly cogent technical arguments for leaving out a headphone jack in a phone this large and 8.5mm thick, it probably does make water resistance easier to apply. The HTC U11 Plus is rated at IP68, meaning it can be submerged in 1.5 metres of water for 30 minutes. IP67, the more common rating, limits the depth to 1 metre. There's also a fingerprint scanner, sitting on the back, rather than the front as in the HTC U11. It's quick and reliable, and unlike the Samsung Galaxy S8, it does not sit in an awkward position. The HTC U11 Plus has a 6-inch 1440 x 2880 LCD screen. If you're not used to the resolutions of this new breed of 18:9 aspect phone, that's the equivalent of a 1440 x 2560 screen like the HTC U11's, with more vertical pixels to fill in the added space. HTC calls the screen “Super LCD6”, a proprietary take on the IPS tech we see in most good non-OLED phones, tablets and laptops. Turn up the brightness and take the U11 Plus into a dark room and you'll see its black level isn't quite OLED standard. However, its white tone is clean, and day-to-day you'll be hard-pressed to notice the contrast difference between this and an OLED. It's a phone, not a home cinema. That said, HTC's big claim for the display is that it can fulfill the DCI-P3 color gamut. This is the range of colors used by the film industry, with much deeper tones than the sRGB standard monitors, phones and printers are traditionally measured against. You can switch between the sRGB and DCI-P3 standards in the HTC U11 Plus's settings menu. And, sure enough, the DCI mode looks seriously saturated. The sRGB mode is on hand for those who like a more relaxed look, which we actually prefer here. The one complaint: top brightness does not seem all that high compared with other high-end LCD phones. We didn't struggle to use the HTC U11 Plus outdoors, but we were reviewing from London. It's hardly the sunniest place on Earth, even on bright days.